I'm glad to leave Singapore- its draconian laws and secret police. The nightmare that I might somehow be framed with drugs and end up on death row would be much less vivid if I believed the island nation had any sort of due process or flexibility in meting out punishment. I've flown to Penang, an island just off the Malaysian coast. The roads here are narrow, and as wealth has increased over recent years, so has traffic. A minute outside the airport my cab driver tries to sell me on the idea of hiring him for the next day, describing the attractions as far apart. "Where is the Snake Temple?" I ask him. I think he is joking. "Really?" "What, you think I’m joking?" "Wow, okay, can we stop? I'll give you a tip." The car pulls over instantly. 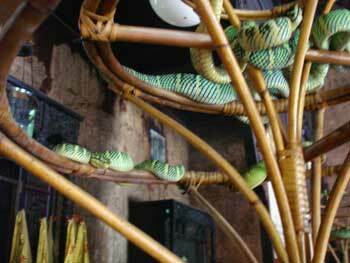 So, here I am at the Snake temple, where deadly pit vipers freely roam. It’s straight up an Indiana Jones nightmare, but I gotta see it. Although vipers are normally aggressive, devotees of the temple believe the thick clouds of incense smoke makes them tranquil. I would largely agree, with the minor exception that I was bitten by two of the serpents and told not to come back. "This our house!" I quote one of them as saying. Legend has it that when the temple was first built back in the 1800’s, lethal snakes slithered into the house of worship from the surrounding jungle. The founding monk, who apparently drank a little too much wa-wa juice, deemed this to be a good omen, and the serpents were allowed to stay and breed ... this would not have been my solution. Today, the snakes slide around the temple, looking for someone (anyone) to bite, but kept at bay by handlers who pick them up with a forked stick and place them in trees, either real or man-made. Today with the urban development that has taken place, vipers no longer make their way to the temple from the jungle which once surrounded the grounds. The forest is all but gone. You'd think this would be a welcomed development, but apparently devotees actively bring and donate these poisonous snakes to the temple on Chor's feast days. I exit, grateful that I didn't get here on Chor's feast day. ("Look at my snake Rich! Isn't he a cutie? Go ahead, touch him, he doesn't bite.") My cab pulls up just as I exit out the building. I see this as fortuitous event, now I'm hoping they keep anti-venom at the local hospital. 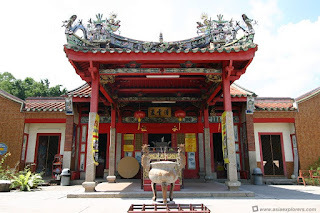 All kidding aside, if you're in Penang, Malaysia, you definitely want to visit the snake temple. Great write-up about the Snake Temple, if anyone happens to visit Penang and would like to have a feel of how staying in local property feels like, feel free to book through our website for homestay or look for affordable budget hotel. Head over to our website to browse through the properties.